The mainstream media has just discovered how illegal asylum seekers are making their way into Canada through New York State. Thank goodness the dinosaur media has finally awoken and is covering a story the Rebel broke well over a year ago. According to French language news outlet, TVA, pamphlets are floating around Plattsburgh, New York that are encouraging illegal immigration into Canada. The leaflets are being distributed around hotels and bus stations informing the surge of migrants headed to the Canadian border about the best way to submit an asylum application at an illegal point of entry. They include contact information for Montreal immigration lawyers, social service agencies and the best taxi company to take to Roxham Road, the main illegal entry point into Quebec and maybe the most lawless strip of road in Canada. An organization called Plattsburgh Cares developed the brochure, showing total disregard for the laws and the people of Canada and unwittingly publishing a how-to manual to avoid detection by authorities that can also be used by MS-13 and human traffickers. Watch as I show you excerpts from former Rebel reporter, Faith Goldy’s exclusive undercover investigation into the migrant railroad in Plattsburgh, NY from last year. She discovered an entire network of business and people that help the illegal migrants break Canadian immigration laws. They’re a little late to the game but it’s nice to see the mainstream media finally wake up to the crisis on the Quebec border. It’s equal parts hate for the Rebel and love for the Liberals that drives this mainstream media cone of seclusion around these very important stories that we've covered. But as long as the the mainstream media continues to filter their news, I’ll always have a job to do. The new liberal dumping ground. 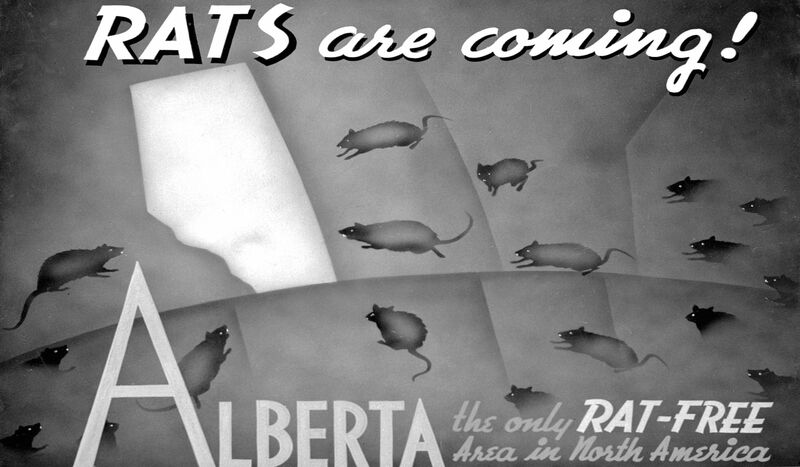 Help Keep Alberta Rat Free. I’m so grateful for reporters like Faith and Sheila. They risked their health going to dangerous protests to get us the truth. Let’s hope and pray that the dinosaur media goes extinct from lack of viewers and ad revenue. Canadian Patriot, unless Alberta has a wall around it, those illegal will end up spread out all across the country. They are coming in east and west and I am sure even a few up from Montana. Alberta won’t be immune to the flood. North South East, West and everywhere in between. Just look at Fort Mac, they are preparing or they wouldn’t have built the largest Mosque and Islamic compound in North America up there. That light at the end of the tunnel some think they see, is the train headed straight for us, and its not even on time, with Justin’s facilitation, its early. “I bet they see some threat to their jobs by being replaced by some of these immigrants , or i doubt they would care. " You bring up a valid point Drew. Many jobs not just governmental postings are now “politically correct”. They have discarded the logical “must have qualifications and experience in said field applying for”. So these illegal immigrants will be at the head of the line for the job postings should they apply due to the “inclusive” hiring practices and procedures. “The federal Department of Fisheries was seeking a regional communications director in Vancouver. It sounded right up his alley. The pay also wasn’t bad — up to $99,700 a year. Mr. Gage wanted to apply, but one fatal flaw disqualified him: He’s white. The ad, which was posted on the federal government’s Web site, was explicit. Under the heading “Who can apply,” it said: “Persons working or residing in Canada and Canadian citizens living abroad, WHO ARE MEMBERS OF VISIBLE MINORITY GROUPS.” The Employment Equity Act, it explained, defines members of visible minorities as being “persons, other than aboriginal peoples, who are non-Caucasian in race or non-white in colour.”"
Yeah they do and they will fight us hard. No ones heels are dug in more than Hussen’s. Listen to that guy and watch him. Really bad news. He shows how much he loves his new home every time he opens his mouth. We are under attack by our own politicians. It should be clear to everyone. Ezra jokingly mentioned a bus in his show to taxi illegals over to 24 Sussex. I would be all over paying for that. Hell I would drive it myself. You voted for the Prime Idiot, Quebec. Enjoy being second class citizens in your own province. Alberta can’t give you any more money because the clown you voted for has blocked all pipelines to enrich his Moslem friends in Iran and Saudi Arabia. Somebody should kick some liberal Butts. Trudeau has been banking on this issue to win him the next election, from the day it became noticed by the Canadian public. He’s going with the notion that the average Canadian voter is so damned I’ll informed that when the election rolls around we are going to hear a lot of accusations against Conservatives. Such as bigots, racists, uncaring, anti-immigrants, hateful, predecessor, Harper, did I say racists, islamaphobic. Watch him in question period. Problem is, the sheer volume of illegals crossing into Canada has and continues to exceed anyone’s predictions. Even Ralphie can’t hide it. Plus, the US ain’t in a rush to do anything and why would they? Illegal immigration and the marijuana legalization (which ain’t going as planned either) is all Trudeau has left in his bag of goodies. Neither of these will be a cake walk from here on regardless. Another year of a growing tent city is exactly what Butts and his puppet are hoping for. What else is there? He’s been nothing short of disastrous on every other file. And the trend in the polls shows the average Canadian is finally through his fakery and lying. For the sake of Canada let’s pray this downward spiral in the polls continues. And the fact is, his senior advisor Butts and himself have brought this on all on their own. Those depending on the MSM for their News are a Year Behind The Rebel. I bet they see some threat to their jobs by being replaced by some of these immigrants , or i doubt they would care. The islamic immigration minister and his islamic prime minister love it. Since 9/11 – IN THE NAME OF ISLAM (SATAN): 35,357 Attacks, 229,171 Killed, 309,307 Injured that we know of. I would like to see rebel send a reporter to the border where the fake refugees are coming over. Install rapid fire machine gun posts every 20 meters all along the Canadian boarder, triggered by motion and sound detectors and auto fed by motorized belt. This could be paid for by starting a meat pie factory and selling it’s wares on the American side of the boarder. Obviously, Trudeau and company support human trafficking….when will they be arrested?! !